Samsung is setting the industry bar higher for the entire mobile industry, says JK Shin, CEO and president of IT and mobile division. 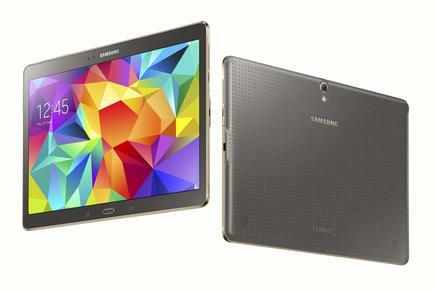 Samsung unveils Galaxy Tab S, its thinnest and lightest tablet, highlighting not only its advanced display technology but also its “enhanced productivity features for effortless multi-tasking”. “The tablet is becoming a popular personal viewing device for enjoying content, which makes the quality of the display a critical feature,” says JK Shin, CEO and president of IT and mobile division, at the launch at New York’s Madison Square Garden, and screened in Auckland. The Galaxy Tab S will be available in two sizes, 8.4in and 10.5in, and Samsung says its biggest draw card is the use of a Super AMOLED screen. It says this screen is “the next evolution in mobile display technology”. Users can view content clearly and easily outdoors, even in bright sunlight. Samsung claims the Super AMOLED screen is more efficient than an LCD and can supply the tablet up to 11 hours of 1080p video playback on one charge. It also has Ultra-Power Saving mode. At the launch in Auckland, Samsung highlighted the tablet’s productivity and security features. Biometrics is integrated into the tablet through a fingerprint reader that is part of the Multi-User Mode. Up to eight different accounts can create their own profile, accessed with a built in ‘fingerprint scanner’. Samsung is setting the industry bar higher for the entire mobile industry. Users can make and receive calls directly from their phone to their Galaxy Tab S, no matter where their phone is with the Call Forwarding feature via SideSync 3.0. Users can surf the Web, watch videos, share content and make calls simultaneously without having to worry about closing out of one to access another. With Quick Connect, Galaxy Tab S finds and connects to nearby devices, for easy content sharing. Galaxy Tab S 10.5 32 GB, NZ$849; Galaxy Tab S 10.5 16GB, NZ$749; Galaxy Tab S 8.5 16GB, NZ$599.